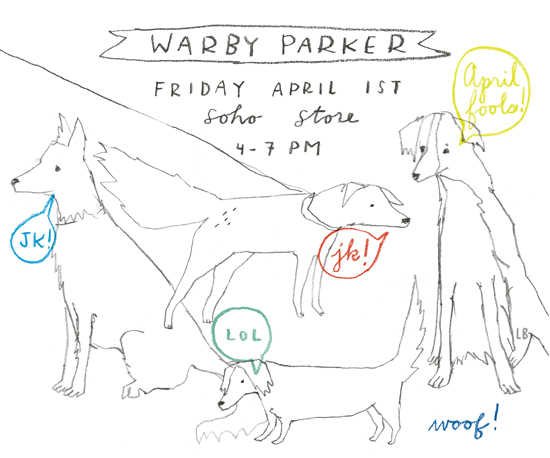 Friday April 1st, I will be drawing dogs Warby Parker Soho 4-7pm for their Warby Barker April Fools celebration. Dogs will have glasses to try on and I will be trying my best to work and not cuddle them all night. In March, I took over the YesWilliamsburg Instagram page for a day. I shared 4 of my favorite neighborhood spots. Thanks for having me YesWilliamsburg. In December, I was invited, along with fellow illustrators, Paul Hoppe and Ellen Weinstein, to illustrate at two Warby Parker Holiday events. Warby Parker is a American brand that sells prescription eyewear and sunglasses. Warby Parker had a large holiday marketing campaign focused around small buttons, so as an extension of that, we were asked to create custom illustrated buttons for their event guests. It was a really great time and kept me on my toes. Tom graciously asked if I would like some photos of the event, so he came to take a few photos. If you'd like to take a look, I have them here today. Thanks Jamal and their team for the invite! I'll be drawing buttons at Warby Parker Soho tonight, WEDS 12/9 and next WEDS 12/16 from 6-8pm. More event info can be found here. This past Friday, I went with my best friend Adrienne to New York City's flower district. I don't know how it took me a full 9 years of living in the city before experiencing the morning flower rush. We got there bright and early, around 8:45 am, but still later than their 5 am open time for the trade. It was a really great trip to take for color and display inspiration. We took our time and walked down one side of the street first and then switched over to the north side of the street. It was really great to see all the great flowers the city imports from all over the world. I felt like we were walking into a Great Gatsby-esque scene with every shop we entered (extra cheers for the ice cold air conditioning at every shop to keep their blooms fresh in the 90 degree heatwave). I was especially happy to finally buy my first, and probably, my only bunch of peonies this season. (They were always looking sad at the bodegas on Bedford). Adrienne and I stopped for lunch and then went back to my place to arrange our fabulous blooms. Overall, I would recommend checking out the district and be inspired! And don't wait 9 years to go! PS. You can read Adrienne's personal account of her time at the Flower District on her blog here.